The overall design really sold me on these gloves, therefore I was extremely surprised and I suppose satisfied with them. Sense the foam was uncomfortable for me these became my double end bag gloves because of the size and shape. The striking surface is very compact and the light weight makes it so you can really whip your punches. To say the least though these a very good gloves for the price. Their performance, quality, almost everything justifies the price and you really won't be disappointed if you try them out. If you're like me and prefer softer, broken in gloves like Winning or the Ring to Cage C17s, it would be best to skip these. These gloves use IMF for padding. It’s a solid piece of foam which makes it drastically different than something like Winning’s layered foam. One of the pros for IMF is that it keeps its shape very well. 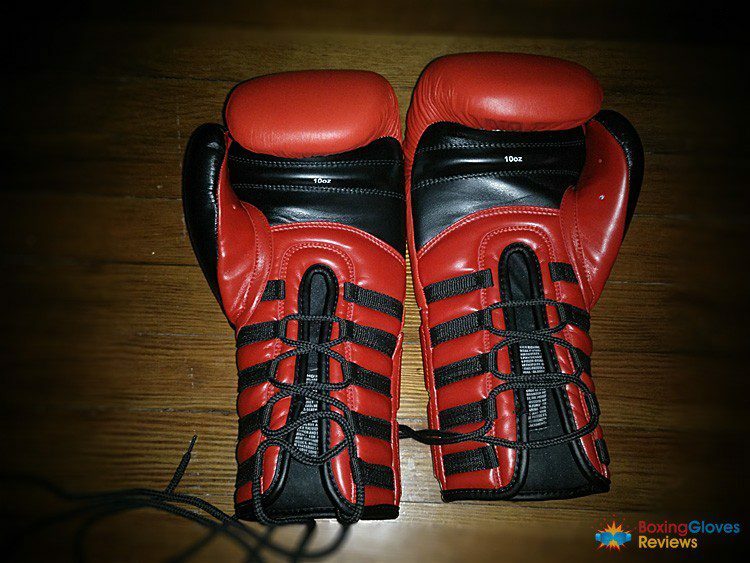 Even though these gloves are professional fight gloves I am not sure if these can actually be used for a pro fight considering the type of foam used. 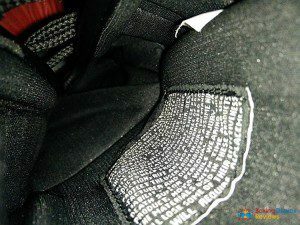 The padding is firm and requires some break in time. That’s part of the reason why I am not a big fan. I’ve used other IMF gloves before like the Combat Sports Max Strike. Those gloves could be broken in by hand, yet these Ringsides even on the bag don’t soften up so easily. 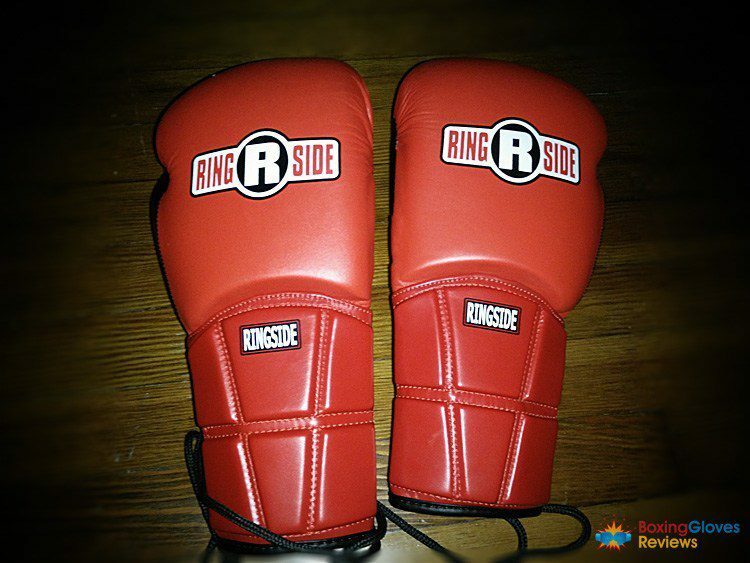 For starters the padding would make my knuckles sore after a couple rounds on the bag. That though, is something that just happened to me specifically. To further test the padding I let some of my training partners use these gloves and they found them to be very protective and comfortable. 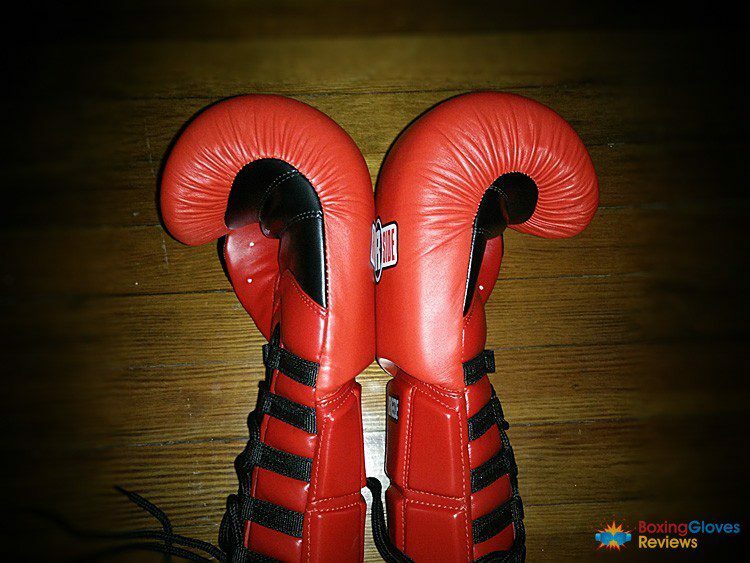 Even though the padding hurt my knuckles the feedback I got from every punch was a new, different feel. Now when I say feedback I don’t mean I felt my knuckles connect, instead I’m referring to the lack of feedback. Because of the springy foam, with every punch it feels like your hands just bounce off. 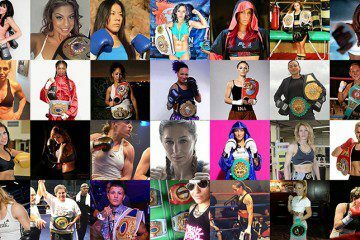 Now keep in mind I’m judging them off of the padding used and not the weight but in my opinion IMF is best used for bags, mitts, but not for sparring. The foam is just not very forgiving even after breaking in so while it protects you it won’t protect your sparring partner very well. One of the positives about IMF foam is that it’s very protective. Think of the foam as a cast because of its almost perfect, consistent shape. 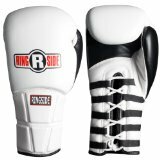 You can really throw your punches in these without having to worry about injury. Also keep in mind that these are 10oz gloves yet on the bag you’re still capable of really smashing your punches. The wrist support in these things is also incredible. Because of the long cuff and IMF it keeps your wrist straight through and through with no real give forward or backwards. The gloves have some of the best wrist support of any lace up I’ve used. Because the padding and protection the performance you get out of these gloves is exceptional. Personally I started using them as strictly double end bag gloves but the people who I let use them, used the gloves for almost everything. For the first couple weeks these were used as bag gloves but the pinch of the seam and the firm padding stopped me. Sore knuckles and an annoying pinch just aren’t a favorable combination. For the double end bag though these gloves were great especially because of the compact size and small striking surface as it makes you work on accuracy more. The same thing can be said for mitt work. Again though this is all from my experience, other people thought they were great for everything. With all that being said I would really advise against using these for sparring, strictly because of the foam not the low weight. 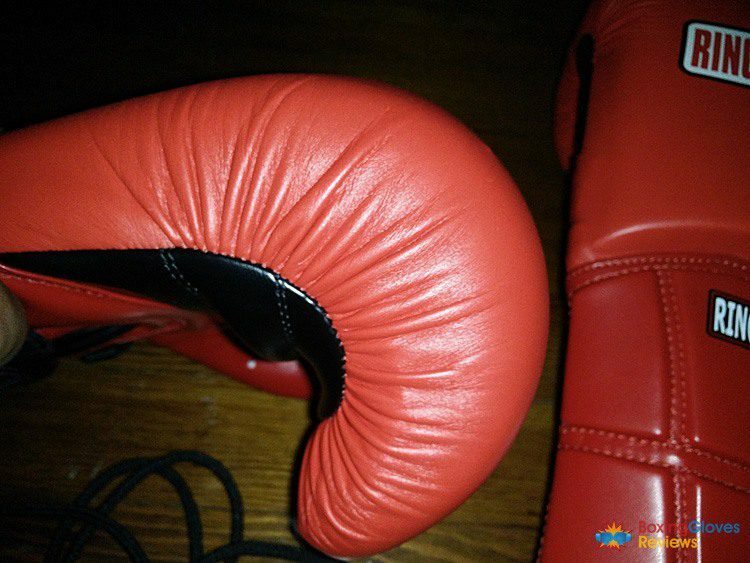 The foam just isn’t ideal for your sparring partner and there are better choices out there for the same price. These gloves are moderately comfortable. 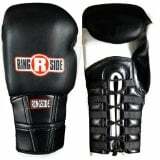 The hand compartment is snug but that’s because of the weight and also the pro fight style. The thumb is straight which is my favorite kind of thumb. It helps to make an ideal fist and in these gloves it’s also very easy to wrap your fingers around the grip bar. The liner is also soft and inviting. It does a decent job at managing the sweat. It’s not my favorite type of liner but it does its job. The problem the liner has though is the annoying and rough tag on the inside. 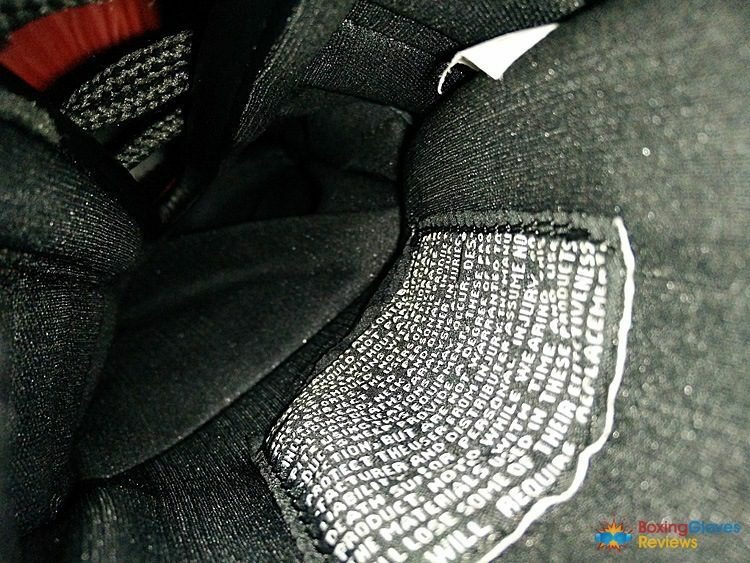 It’s a terrible decision that some companies make to add a tag on the inside of the glove especially because they usually use a rough material. The problems they have when it comes to feel are both the thumb and the padding. Like I mentioned the straight style is my favorite and I suppose the thumb is not the issue but the thumb seam is. The seam of the thumb always pinches my palm. It’s a light pinch so it doesn’t hurt my hand at all but it is very annoying. The seam made me stop using these on the heavy bag because the tighter you made a fist, the more pinch you would feel. Instead I started using them for the double end bag. The padding can also cause discomfort. As mentioned earlier my knuckles would get sore after some rounds but again this only happened to my knuckles specifically. The foam also causes a lot of resistance when opening your hands. 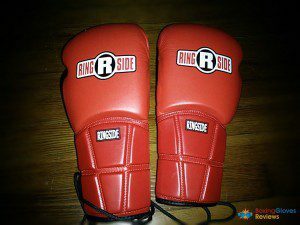 Ringside did an amazing job when constructing these gloves. There’s no loose stitching, it’s all straight and clean. For whatever reason it would seem as though Ringside used two different kinds of leather as well. Both versions are durable but they look different, absolute opposites actually. The leather used on the fist is the dull, more flat version while the leather everywhere else is glossy and almost like a higher quality. The glossy leather is the better looking of the two and the glove overall would look better if Ringside just stuck with one type instead of two. 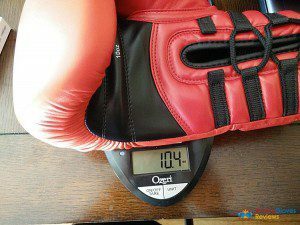 These gloves are also true to weight as they weighed in at 10.8oz for the right and 10.4oz for the left. They’re just a little off. When it comes to durability these gloves past the test. The problem is that they’re more prone to this obnoxious looking bumps. It would seem as though IMF suffers from those blemishes more than layered foam. 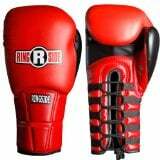 As a comparison I’ve used my Ring to Cage C17s more than these and they have no bumps whatsoever. Besides that these gloves are practically good as new and as mentioned before they have kept their shape due to the type of foam. The stitching, leather, foam, everything is practically exactly like the day I got them. The look is really the main reason as to why I got these gloves. First of all the IMF makes it so they’re extremely rounded gloves. The shape is like a bullet. Every punch thrown feels like you can cut the air due to the aerodynamic shape. The QTT or Quick Tie Tech is not only a functional innovation by Ringside but it also adds a very great addition to the overall aesthetics. The channels on the back of the wrist allows the laces to fit though perfectly but they also give the look of some type of gauntlet. These gloves come in four different two color combinations and each one looks as good as the last. These gloves go for around $100. For that price I have to say they’re worth it. Mine cost me $80 because they were on sale but $100 is a fair price. The overall quality and construction is top tier. There are gear within the same price range with terrible quality control. These would be some of my favorite gloves if they used a different type of foam too. So overall incredible gloves for the price. As I mentioned before these would be some of my favorite gloves if the foam was different. Personally I am just not a fan of IMF and these gloves taught me that. You have to break it in, until then it’s a little uncomfortable, and it could take a while to break in. That’s all just my opinion though, like I said I’ve let others use them and they did not mind the foam at all. IMF also has some pros compared to other foams, such as how they keep their shape or how protective it is. Already own Ringside IMF Tech Pro gloves? Write a review bellow. Editor’s Note: This post was originally published in Aug 5, 2014 and has been completely revamped and updated for accuracy and comprehensiveness. 3. IMF Tech gloves provides a snug, yet very comfortable fit. 4. Print on the front looks great and is very well-done. 5. Gloves conform to the shape of a fist easily. 6. Does its job of keeping the wrist secure very well. 7. Felt comfortable while was used both for sparring and bag work. 8. Stitching is top grade. 1. I had a bit of trouble opening up my palms when I wanted to do clinching or to catch jabs. 2. No air holes. The inside of the Ringside gloves heat up very quickly. It can be a bit of a hassle to dry them out after every use. 3. Needs time to be broken in. I actually just worn these Ringsides a couple of times, so can’t really judge them as good as Lobo, who owns them for over a year. Anyway here are my Pros and Cons.